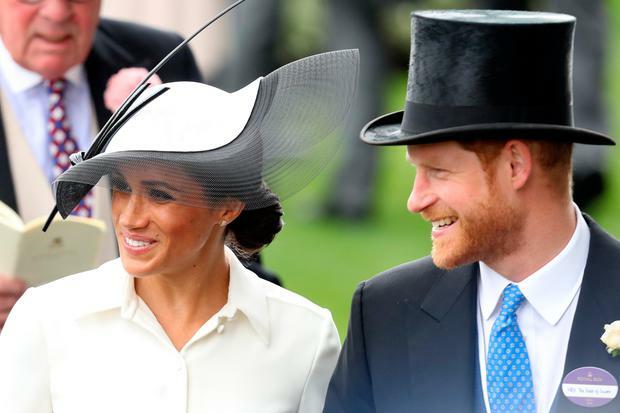 Meghan Markle chose a hat by renowned Irish designer Philip Treacy for the opening day of the Royal Ascot races. Ms Markle and her husband, Britain's Prince Harry, received a rapturous applause as they arrived at the prestigious event this afternoon. The pair joined Queen Elizabeth, Princess Anne and Prince Andrew, Prince Charles, his wife Camilla and Princesses Eugenie and Beatrice at the event. The former Suits actress chose a monochrome hat by Irish designer Treavy fopr the event, teamed with an embroidered cream coat and chic black accessories. This comes just hours after Kensignton Palace confirmed that the newlyweds are set to fly into Dublin on July 10 to carry out their first official engagement here since they tied the knot last month. Their mini-moon is set to last just one night, with the newlyweds scheduled to leave Dublin again on July 11, a Kensington Palace spokesperson confirmed. "The Duke and Duchess are looking forward to learning more about Ireland's history and experiencing its rich culture, as well as meeting the people who are shaping the country's future," a source told the Irish Independent last night. It will mark their first official trip abroad together since their May 19 wedding. Further details about their trip to Dublin are expected to be confirmed in the coming days. Meghan has strong links to Dublin, having visited a number of times before she met her husband. The couple visited Northern Ireland in April. This comes shortly after Prince Harry's father, Prince Charles, and his wife Camilla enjoyed a visit to Cork last week. During their stay they met Tanaiste Simon Coveney, browsed at the delicacies available in the English Market and attended a civic reception at Cork City Hall.